← How many flying seasons? With whom will you spend them? Here is a short set of notes from Pietenpol builder and flyer Bob Lester. It describes how after several years of not being able to coax his 65 hp Lycoming to carry his Piet from Florida to Brodhead, he was able to make the trip without issue after his Corvair Conversion. 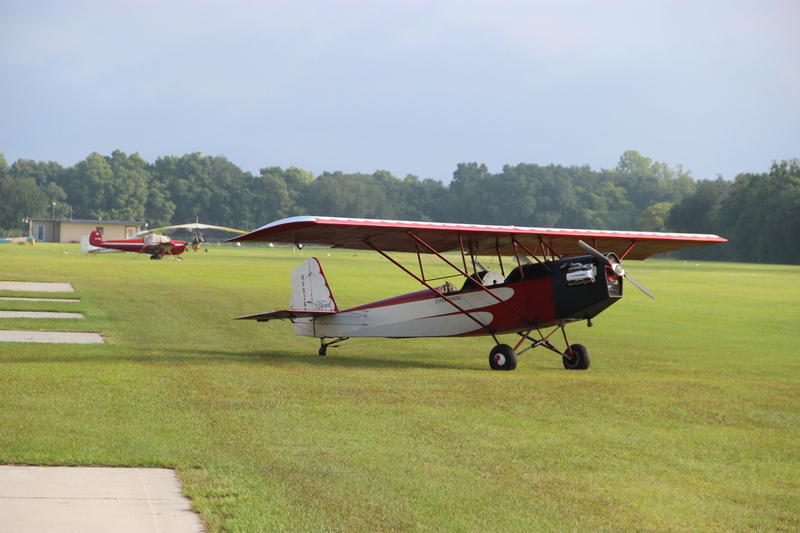 There were many Piets on hand at Brodhead this year, but Bob’s clearly flew the furthest, and his trip was made old school, without ground support. 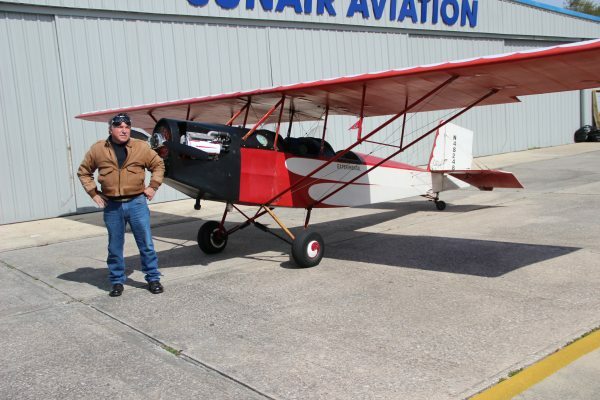 Bob has done many things with planes in the last 40 years, but he will tell anyone that flying his Piet around the country the last few years, barnstorming as if it was the 1930s, is the most fun he has had. He now has about 300 hours on the conversion. Above, Bob Lester’s Pietenpol at CC #33. Bob gave an intro flight to almost all of the Pietenpol builders on hand. engine in my Piet at the time, 3 years due to weather, and 1 year due to family health issues. Well this year was my year. I had long since installed a 2700 Corvair in the Piet, and the weather was going to be with me ( more or less) for the trip. I planned for ten days ( including a side trip to central Minnesota to view the farms that my great grand and great great grand fathers had lived on in the 1800’s ) with several overnight stops at the homes of old friends. Day one took me from my home at Little River Airpark in McAlpin Fl to 49A Gilmer Co in Ellijay Ga. For a nice visit with friends from Jr High in 68. A total of 7.0 hrs flying . Day 2 took me east then north over the mountains ( following a hi way ) to KJVY Clark Co in Jeffersonville In. to visit a good old friend of mine from way back. A total of 5.8 hrs. Day 3 had me pinned down until noon waiting for the rain to pass over to the north. So I headed west until night fall to land at KBRL Southeast Iowa Regional at Burlington IA to find a cheep cab ride to an expensive motel room. A total of 7.6 hrs. Day 4 had me heading North to Austin Min then West to KFRM Fairmont MN. A total of 6.0 hrs Here I rented a car and drove out to view the farms that I had only been able to read about for the last 45 years. Took pictures to show my brother. Stayed an extra day. Day 6 left a dawn to fly East to land at Cherry Grove ( birthplace of the Pietenpol ) only to find the runway grass was knee high. So I pressed on to Brodhead WI . A total of 7.1 hrs. This trip was a total bucket list thing that I’ve wanted to do for over 20 years. It was great fun, and I may just do it again next year. If you’ve always wanted to do something like this but haven’t yet j, just do it . You’ll feel a lot better about yourself. Neat-o! Way to GO BOB! That’s a lot of time in the saddle, and a successful trip means you planned well. Glad you got to make the journey, and it encourages all of us to find our own adventure. blue skies.